Updating a bedroom or bathroom can become pretty costly, which many homeowners find out when they begin a new home project. Replacing old tile and lighting, adding new countertops and wall colors, and sprucing things up can add on to the bill fairly quickly, and often these jobs require the services of a professional — which can cost a pretty penny in itself. Yet, our homes — and these two rooms in particular — are a source of comfort, a place where we should be able to relax and de-stress, and making it a space where you feel good is essential. 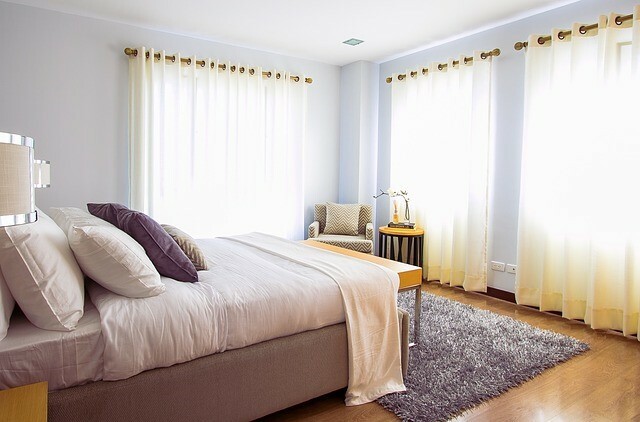 Fortunately, there are several things you can do to boost your bed and bath and turn them into the best rooms in the house, and they don’t require derailing your household budget. Focusing on the details — such as adding new bedding and towels, updating the wall colors, and changing out smaller pieces of decor — can make a big difference in the look and feel of these spaces, meaning you can make some important changes without spending a ton of money. Your bedroom is the one place in the world where you should be able to completely relax and focus on your own needs, and one of those needs is good sleep. This is why it’s crucial to take a look at things like window coverings, bedding, temperature, and scents around the room to make sure they don’t detract from your rest habits. If you’re a hot sleeper, adding a fan might help you get into a deeper sleep. Stay up late working? Hang some blackout curtains to keep the sun from waking you early in the morning. Soft, breathable sheets will keep you comfy all throughout the year, while neutral or relaxing colors on the walls will help you relax at the end of a long day. If you have trouble winding down, consider using an oil diffuser or noise machine in your room. If your walls are bare — or if they’ve held the same artwork for quite a while — changing things up can be a very easy and budget-friendly way to change the look of your bedroom. Look online for some prints you like and frame them yourself to save money. Hanging several pieces by the same artist can create a lovely tableau that will elevate your space and make it look more curated, and it can even create some feng shui elements. If your spaces are small, add a little sparkle with mirrors or a shower curtain with a fancy vibe. This will help make the area seem a bit more luxe, and mirrors will give the illusion that the space is much bigger than it actually is. You can also paint the ceiling a light color to draw the eye up, and use tall shelving to elongate the walls. This is also a great solution for storage when you don’t have a lot of horizontal room to spare. Many people tend to take care of everyone else before they make sure their own needs are taken care of, and this can lead to you discovering that the things you use every day have become old, tattered, and worn through. Towels and washcloths get a lot of use, and replacing these is a wonderful way to add some color and a luxurious spa-like vibe to the bathroom. Look for fluffy hand towels and a new bath mat, but try to stay away from white, as this will show dirt. Updating your bedroom and bathroom is a great way to make your home feel more comfortable and personalized, and it doesn’t have to cost a ton of money. By planning ahead of time and looking at the details, you can boost these spaces quickly and easily.